What’s the best way to engage employees on Environmental Sustainability: Bottom Up or Top Down? We all know engaging staff in a meaningful and authentic way is one of the most fundamental and crucial steps to realising your organisational strategic objectives. Here we share some practical insights on various approaches employee engagement program design that will help support your organisation’s environmental sustainability strategy. Earlier this year we completed the delivery of an Environmental Employee Engagement Strategy for one of Australia’s largest financial institutions. The brief for the project was to design a program that would engage and empower their employees across the globe on the issue of environmental sustainability with the aim of supporting their operational environmental performance targets and aligning with their wider external facing, purpose-led corporate agenda. As part of the ideation process, our team reviewed environmental engagement programs from across the globe, documenting and categorising the different governance models and implementation methods. Four key approaches emerged: Policy/Regulatory Led; Communication/Technology Led; Volunteer Led; and Appointed Personnel Led. An organisation’s approach depends on the resources (both human and financial) available to implement the program, and the primary stakeholder group responsible for implementing and overseeing initiatives. In a perfect world, organisations would implement elements from each quadrant. Sector leaders like Patagonia or Unilever adopt a multi-pronged approach to environmental engagement. Their approach to sustainability incorporates a mix of dedicated and volunteer sustainability related roles with sustainability-focussed KPIs (bottom up), supported by global campaigns and rigorous corporate giving, procurement and hiring policies (top down). For Patagonia and Unilever, there is no such thing as an ‘environmental employee engagement program’, it is simply built into the DNA of the way they do business. Most organisations don’t have the luxury of taking that transformational approach and instead need to find the model that will give them the biggest bang for their buck. To help you out, we’ve outlined below a summary of these categories and their associated pros and cons. This is essentially a compliance-oriented model, where business units need to adhere to various processes and guidelines in relation to HR, procurement, property management, supply chain and product design. The intention is for good practice to vicariously filter down to employee values and behaviours. Examples of initiatives: Sustainability guidelines for suppliers and contractors, operational guidelines for facility and waste management, key principle for product design and procurement. Pros: Can extend beyond employees to suppliers and products, can more efficiently integrate sustainability into the everyday roles of employees, can enforce a high level of compliance, requires minimal human resources to execute. Cons: There can be a tenuous link between a company’s policies and the ‘values’ it would like to instil in its employees without the communication, lacks the ‘value based’ communication, limited on-ground visibility, limited local customisation. This is a centralised approach that tends to be campaign led, primarily leveraging traditional communication tactics such as email, intranet, events and signage. This can also be supported by data empowered technology to provide feedback to employees on performance, or easily accessible workplace giving platforms, both of which can be resource intensive. Examples of initiatives: Communications led behaviour change campaigns, gamification of environmental performance data, central office events and seminars. Pros: High global reach, maintains consistent voice and values across all offices, supports external positioning, provides feedback mechanism on performance. Cons: Data lead feedback can be expensive, minimal local customisation, lack of on-ground ‘tangibility’ with solely communications activity. A form of bottom up governance that relies on passionate and dedicated individuals to execute initiatives outside their core roles. This is often supported by a semi-structured volunteer program which might outline various initiatives that team members can undertake. It can be supported by customisable collateral and campaigns provided by head office. Examples of initiatives: Local volunteering opportunities, localised office waste challenges. Pros: Enables passionate employees to step forward, enables some level of localisation, promotes authenticity. Cons: Action will be de-prioritised based on other work requirements, lacks central and consistent ‘voice’, volunteers lack of meaningful ‘authority’ to take action, lacks authenticity without leadership support. 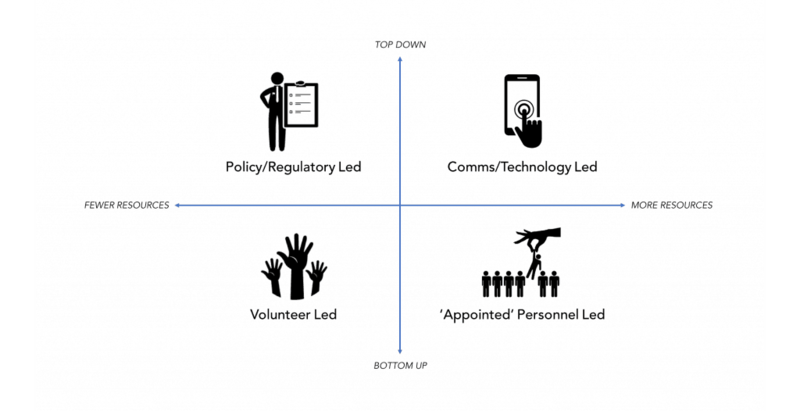 A more formal bottom up governance structure where passionate employees apply, are assessed and appointed as ‘green leaders’ for their floor, building or region. Appointed personnel undergo formal training, identify opportunities for local campaigns and workplace activations. They request resourcing accordingly and have a percentage of their role (5-20%) dedicated to driving engagement for an indefinite or limited tenure. Primary Stakeholder: Appointed passionate personnel at all levels of seniority. Pros: Highly customised to local issues/causes, high sense of empowerment of involved employees, actively engages peers ‘on the ground’ which drives authenticity, values promoted through actions and beliefs of the individuals (rather than the organisation). Cons: Requires engagement from HR, % of time taken from core role, still requires centralised support. So, I hear you ask, which model did our client land on? Well, out of our ideation process it became clear that the program required several key characteristics to meet their strategic objectives; it needed to be highly customisable to address the key environmental concerns of local region, it needed to harness the passion and enthusiasm of individuals on the ground, and it needed to implement a form role structure in order to demonstrate an authentic, long-term commitment to the program’s success; all of which pointed to an ‘Appointed personnel’ led model. This of course is potentially the hardest model to implement, requiring significant resources and by-in across the business. So, the remainder of our engagement was dedicated to developing a detailed roadmap that would help them transition to this model over time, in a way that built momentum and value-based authenticity amongst both the employees and leadership. This is an evolving field and we’re always keen to progress the conversation. If you’d like to weigh in, we’d love to hear from you, leave a comment in the Reply section below.